Editor’s Note : The trigger for the Kiev protests in Kiev has been the decision by Viktor Yanukovych’s regime to turn its back on the European Union, which was offering the Ukraine a long sought after trade partnership. Yanukovych’s belated decision to snub the EU has been widely seen as a craven gesture of appeasement to Russia, which feared the Ukraine might become a channel for a massive influx of EU goods into Russian markets ; and reportedly, Putin had threatened to exploit the Ukraine’s energy dependency on Russian natural gas, if Yanokovych had opted for closer ties with the EU. In the wake of the protests, three main opposition figures have emerged : the heavyweight boxing champion Vitali Klitschko who may be a presidential contender in 2015, the far right nationalist leader Oleh Tyahnybok, and Arseniy Yatsenyuk, an ally of the jailed former leader Yulia Tymoshensko. The brutality of the Yanokovych regime’s response to the protesters has revived Tymoshenko’s career, after charges of corruption during her term in office. There’s a useful BBC q&a on the background to the Kiev demonstrations here. At the office of the Ukrainian Prosecutor General, employees – prosecutors, assistants and secretaries – step cautiously over human bodies to get in to work. The bodies are alive, lying on the frozen ground in protest at the imprisonment of innocent people – ‘The Nine’; and calling on the Ukrainian Prosecutor General, Viktor Pshonka, to set them free. A short while ago, these detainees were ordinary, peaceful people. They didn’t know each other, they had had no problems with the law, and they worked in a variety of jobs. They include a journalist, a long-distance lorry driver, a manager, a sales assistant, a student, a photographer, an architect and an engineer. They are from different parts of Ukraine, and had come to Kiev for the peaceful Popular Assembly (the Veche) on December 1st. Now they are united in imprisonment – and have been accused of organising mass public disturbances near the Presidential Administration on that day. When the demonstration was broken up, these nine unfortunates were arrested and brutally beaten by the Berkut [‘Golden Eagle’], the Interior Ministry Special Forces. They are all badly bruised, with broken bones; some have concussion. Instead of meting out punishment to the Berkut, the authorities used the courts to arrest and hold the protesters in pre-trial detention. Seven of the arrested remain in hospital. Another two are in police investigation cells. If found guilty, the prisoners of Bankova Street (where the Presidential Administration is located) face prison sentences of between five and eight years. The night of November 29th and the day of December 1st have already been called the bloodiest in contemporary Ukrainian history. First, the Berkut beat up, and then cleared, the students and activists from Maidan [Independence Square], protesting at the about-turn on the Association Agreement with the EU. This violence was followed by a planned act of police provocation, and an even more violent clearing of the square, with arrests of the protesters on Bankova Street. The real instigators ran away, and innocent people, who had come to the Presidential Administration to make their civic feelings known and protest against the bloody dispersal of the demonstrators in Maidan, were arrested. Immediately after they were arrested, these nine people were beaten with heavy boots and truncheons so violently that many of them passed out. They were kept for several hours on the icy asphalt. Some of the Berkut ‘warriors’ then had their pictures taken with their victims, who had lost consciousness. This all took place in the courtyard of the Presidential Administration, the office of the head of state and guarantor of the Constitution; and emerged only by chance when Vladimir Tishchenko, a journalist, filmed the beatings, and posted it on the Internet. When the arrests became common knowledge, people watched the broadcast video, and picked out the faces of their relatives. ‘Can you imagine what I went through?’ asked Marina, wife of Alexander Ostashenko, a family man and engineer, father of a five-year old daughter. The video showed Ostashenko being beaten up; as the Berkut ran towards him, he put his hands up and stood still; a Berkut officer then kicked an apparently lifeless Alexander, to see if he was still alive. His wife told me that he has concussion, two broken fingers, a bruised ribcage and haematomas all over his body. In the hours immediately following the attack on Maidan, the family and friends of those who had been arrested were in despair – the detainees couldn’t be reached by mobile phone; it subsequently emerged that many of their mobiles had been stolen or destroyed. It was near midnight by the time they were allowed to inform their families where they were; and nothing more. Jana Stepanko found her fiancé Nikolay Lazarevsky, on the video. She saw him being kicked in the face, as he raised his hands to shield himself from the blows. The video also showed his wallet being stolen. He now has concussion, open wounds on his head, a broken nose and hematomas all over his body. ‘His head is stitched up from the top to the neck. He’s in constant pain and there are no painkillers. His hands are also very painful.’ All of those detained have a similar collection of injuries. Gennady Cherevko, for instance, was knocked off his feet and beaten so badly that his right arm was broken, and he had cuts to his head. Yegor Previr drifted in and out of consciousness after his treatment at the hands of the Berkut. He wasn’t only beaten, but stripped of his clothes and made to lie on the asphalt. If he made the slightest attempt to move, they stamped up and down on his frozen and shuddering body. He received medical attention only on the morning of the next day. He has cerebro-cranial injuries, a broken nose and a dislocated jaw. He lay for five days in his blood-soaked clothes, until his lawyer insisted that he be given a chance to change them. Vladislav Zagorovko is a long-distance lorry driver, and father of three young girls. He has suspected retinal dissection, because he has fragments of a stun grenade in his eye. He couldn’t see, so was unable to get away. 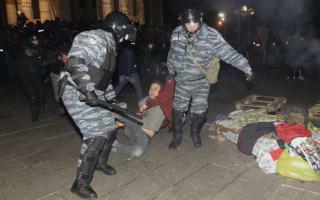 He fell into the hands of the Berkut, was made to kneel down and viciously beaten. It was only the intervention of an official working for a human rights organisation that got him taken to the Institute of Ocular Microsurgery. If he doesn’t have an operation, he will go blind, but for the moment the inflammation in his eye is so bad that the doctors must wait. Yury Bolotov, ex-manager of the famous Ukrainian group ‘Ocean Elsi’, was not part of the protests on Bankova. He had agreed to meet a friend not far from the Presidential Administration, and was waiting for him. When Berkut officers ran up to him, he put his hands up. They asked him who he was, and he replied that he was a local, from Kiev. He was knocked off his feet and dragged along the whole street into the courtyard of the Presidential Administration, where he was beaten. He has many soft-tissue injuries, his back is one huge bruise; and his elbows and knees are battered. Bolotov was not part of the protests. 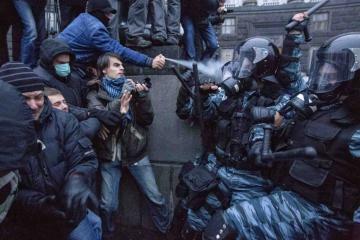 He had been waiting for a friend when he was approached by members of the Berkut, who proceeded to beat him. As mentioned, the nine victims of the Berkut violence could go to prison for anything from five to eight years. It is clearly of no interest to anyone in authority in Ukraine that ‘the Nine’ are civilians with no previous connections to any radical groups. They all have homes, jobs; and many of them had not been in Euromaidan before. They were protesting peacefully, and yet Justice Minister Yelena Lukash has stated that the government will be meting out punishment to all those people who, ‘beat up Berkut officers with such abandon.’ It is clearly of no interest to anyone in authority in Ukraine that ‘the Nine’ are civilians with no previous connections to any radical groups. Witnesses to the truth, however, are under pressure. A doctor from the Accident and Emergency Hospital, where six of the detainees are being treated, has just been sacked. Attempts were made to force the doctor to sign a document, which would have allowed the Bankova victims to be transferred to a pre-trial detention facility. The only hope that justice will be done is an appeal: friends, family and colleagues of the nine detainees are collecting references and evidence of their innocence. ‘There may have been tears and hysterics after the arrests, but now the court decision has made us realise that tears are not enough – we have to fight. Ordinary people are doing what they can too: there is a special Facebook page where breaking news is posted, and money is being collected for the families. Many of those under arrest were the breadwinners. Lorry-drive Zagorovko with his three daughters, for instance. The court will now consider the first appeal, against the unlawful arrest of Valery Garagutsy. He himself was not brought in to the court room: his lawyers asked for a videoconference, something that is allowed under the new Criminal Procedural Code, but the court was unable to organise it, and refused to consider the case without the accused. The judge adjourned the case, initially to December 17th, but those present in the court made such a fuss that the date was brought forward to December 13th. There are several more appeals coming up soon, but they will in all probability be given similar treatment. On the morning of December 3rd, three of the accused (Lazarevsky, Pritulenko and Zagorovko) were searched. Public attention is so focused on this case that the searches passed off with almost no procedural violations. Nothing unlawful was found on the accused. Lawyers for ‘the Nine,’ say that their clients, who were beaten almost to death by the Berkut, are brought to meetings with them in a hall, where they are handcuffed to radiators, as if they were violent criminals and repeat offenders. These innocent people are being framed for a very serious crime, but not one Berkut officer (all easily identifiable from the video) has been stood down from his duties, and certainly not detained or arrested, though there is plenty of evidence that they exceeded their authority. In Ukraine, being in the wrong place at the wrong time has become dangerous. This article is published under a Creative Commons Attribution-NonCommercial 3.0 licence. If you have any queries about republishing please contact Open Democracy. Please check individual images for licensing details.